question What makes a life worth living? 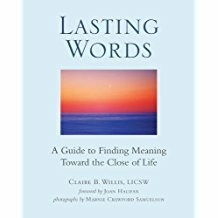 As we age and move toward dying, Lasting Words offers us ways to leave some lasting words so that we are able to close our life with more peace, coherence and meaning. 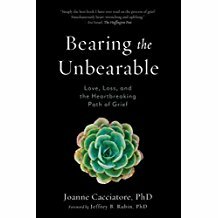 Organized into fifty-two short chapters, Bearing the Unbearable is a companion for life’s most difficult times, revealing how grief can open our hearts to connection, compassion, and the very essence of our shared humanity. Named a Best Book of the Year by The Washington Post, The New York Times Book Review, NPR, and Chicago Tribune/ this book is riveting, honest, and humane. Being Mortal shows how the ultimate goal is not a good death but a good life-all the way to the very end. Criticsl questions are posed to help us think about what we need. Dr. Ira Byock, one of the foremost palliative-care physicians in the country, argues that how we die represents a national crisis today. The Best Care Possible is a compelling meditation on medicine and ethics told through page-turning life-or death medical drama. It has the power to lead a new national conversation. The Buddhist approach to death can be of great benefit to people of all backgrounds—as has been demonstrated time and again. This book affirms our capacity to open and contact to our inner strength and shows us how we can help others who are suffering do the same. Extreme Measures charts Zitter’s journey from wanting to be one kind of hero to becoming another—a doctor who prioritizes the patient’s values and preferences in an environment where the default choice is the extreme use of technology In her work Zitter has learned what patients fear more than death itself: the prospect of dying badly. She builds bridges between patients and caregivers, formulates plans to allay patients’ pain and anxiety, and enlists the support of loved ones so that life can end well, even beautifully. During the last few months of his life, he wrote a set of essays in which he movingly explored his feelings about completing a life and coming to terms with his own death. “It is the fate of every human being,” Sacks writes, “to be a unique individual, to find his own path, to live his own life, to die his own death.” Together, these four essays form an ode to the uniqueness of each human being and to gratitude for the gift of life. Part memoir, part medical history, and part spiritual guide, Knocking on Heaven's Door is a map through the labyrinth of a broken medical system. Its provocative thesis is that technological medicine, obsessed with maximum longevity, often creates more suffering than it prevents. It also chronicles the rise of Slow Medicine, a movement bent on reclaiming the "Good Deaths" our ancestors prized. In families, hospitals, and the public sphere, this visionary memoir is inspiring passionate conversations about lighting the path to a better way of death. Leaves Falling Gently: Living Fully with Serious and Life Limiting Illness Through Mindfulness, Compassion, and Connectedness. The author show us ways to navigate our mind with mindfulness and acceptance in the face of life threatening illness. It is a comforting guide offering compassion practices that help one embrace the present moment, and deepen connections with friends and family. that challenge, uplifts, comforts and change the way we think about death. A profoundly moving memoir of care giving, mourning, and love. The End of Your Life Book Club is also about the joy of reading, and the ways that joy is multiplied when we share it with others. problems and difficulties that life throws our way. Through the stories of seven patients and seven very different end of life experiences, Volandes shows us how advanced technology is not what we most need but instead The Conversation – the most important one we might ever have. Jewish traditions about death, the afterlife and how to care for people in their final days. This internationally bestselling spiritual classic is an introduction to Tibetan wisdom. It is an inspiring and comforting manual for life and death. This has become the definitive text on death. It examines the current state of healthcare and our relationship with life as it approaches the end. It offers way to take control of our own final days and those of our loved ones.